Day 20 of "30 Days of Me"
The meaning behind your blog name. The ways of the Universe are strange and mysterious. So are mine. And "miss_teerious" has been my online identity since the year 2000, when I first got to know about the internet and emails. My first email ID: miss_teerious@usa.net. Paid 20 bucks at a cybercafe in Patna, just to get this *free* email account on usa.net! I wish somebody had told me that I just needed to open the site and fill up an online form! Anyway, usa.net soon became paid. 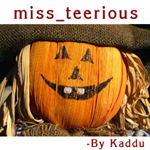 So I moved to other free options--yahoo, rediff and hotmail--always as "miss_teerious". Eventually, I entered into the corporate world, where such *creative* IDs were en passé. So the new email IDs took the boring shape of some combination of first and last name. And then this blog happened... my *personal* space on the web... having no connection at all with my professional life. So it was only befitting that "miss_teerious" returned online. This is my 20th post for NaBloPoMo September 2011. So then I shoved the blame for the weird chant on you. And now she wants me to scram so she can play color junction. Which isn't there anymore on miss_teerious so I created an iGoogle page for her and slapped on color junction as a gadget or whatever its called. LOL! It is a real tongue-twister. As for Color Junction... of course it's still here and still working fine. I play it every now & then. Managed to clear the board last week after like months! Check your browser settings if it isn't showing up.